By default, Excel 2013 uses the good old SUM function to create subtotals and grand totals for the numeric field(s) that you assign as the Data Items in the pivot table. Some pivot tables, however, require the use of another summary function, such as AVERAGE or COUNT. To change the summary function that Excel uses, click the Sum Of field label that’s located at the cell intersection of the first column field and row field in a pivot table. Next, click the Field Settings command button on the Analyze tab to open the Value Field Settings dialog box for that field. 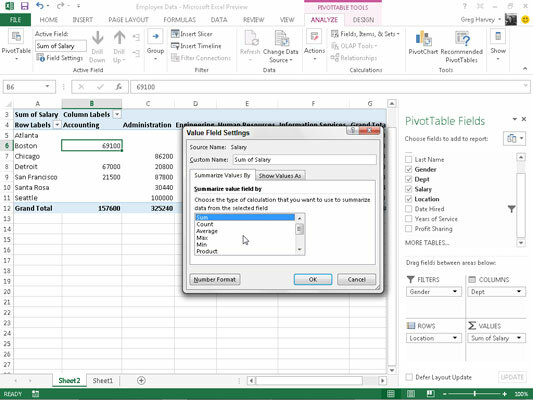 After you select the new summary function to use in the Summarize Value Field By list box on the Summarize Values By tab of the Value Field Settings dialog box, click OK to have Excel apply the new function to the data present in the body of the pivot table.